Do you have anxiety issues? Do not worry, it is normal to feel uneasy at times. 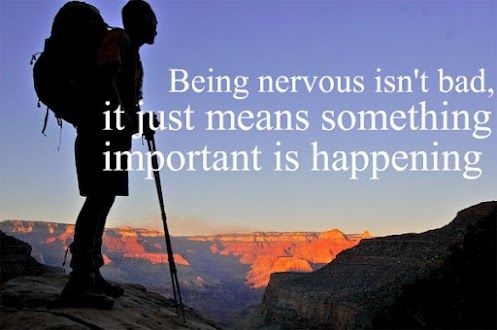 Being nervous is a part of human tendencies. To make it better, some people like to term it as feeling excited, while others like to channel the nervous energy into their work or other activities that can help them relax. These quotes about being nervous will make you feel relaxed and normal. Sometimes it is better to be silent when you are nervous, since silence speaks for itself. When you are nervous, just accept it. It is better to be yourself rather than acting like somebody else. Some people do not know how to relieve their nervous feeling. If you make good preparation, you may feel less nervous. Nervous energy in a group can be multiply and often scary. The presence of special people in your life can cure you nervousness or make it worse. Nervous feeling can cause physical pain. When you are in a nervous breakdown, just try to breath properly and drink some water. Well, love makes you nervous. Just make good preparations for the big thing. Meditation makes you clam down before any big event. Successful people will ease their nervous energy productively. Focusing on your work may help in overcoming nervousness. Even superstars like Beyonce depend on nervous energy to give a good show. Quotes about being nervous for those who are very self-conscious. To know someone well you have to trust them first, which creates nervousness. It is better to be nervous, because nervousness leads to creativity. Britney Spears gets nervous when she is sitting idle at home.